Coral ordered about 30 of these leather keychains. She’s chained me to a chair leaving only my arms free so I can paint all of them. I’ve been given ten “leisure minutes”, as she calls it, to post this blog and let you know about it. Not that I’m being held against my will in a hostage situation, but that we’re stepping up the game and offering hand painted leather keychains. For more details about them and to order please visit the shop at jeffclaassen.storenvy.com. Oh…here she comes. I better go. I’ve gone over my 10 minute limit and for every minute over she sets one donut in front of me just out of arms reach, which is a nightmare come to life. PARTY TOMORROW! Sorry about the late notice, but you are all invited to Huckleberry Market tomorrow night. I have been invited to be the featured artist for September. I’ll have about 35 pieces (paintings and limited edition prints) for sale and a table full of fun artsy merch like shirts, buttons, stickers, etc. Since losing my studio/gallery space in Paso Robles this is a good chance to see my work in person. Come party with me and the Huckleberry crew from 7-9pm. And when I say “party” that means I’ll be high on Thai iced tea. Please excuse my orange teeth. It’s not my fault, it’s the tea. Bottle Cap Opener Keychains are awesome for all sorts of reasons. They are an inexpensive way to get your name/message out there whether you’re an artist, musician, blogger, graphic designer, photographer or if you own a retail boutique, restaurant, bar, etc. How often do you leave the house without your keys? Imagine having your logo on something that people take with them every time they leave the house. And not only that, but it serves a function…it opens bottles! Making custom promotional products for people is an idea I’ve been toying around with for awhile. I’ve been making my own bottle opener keychains for a couple of years and have actually done a few for others, but I haven’t really pursued it too much. Until now! 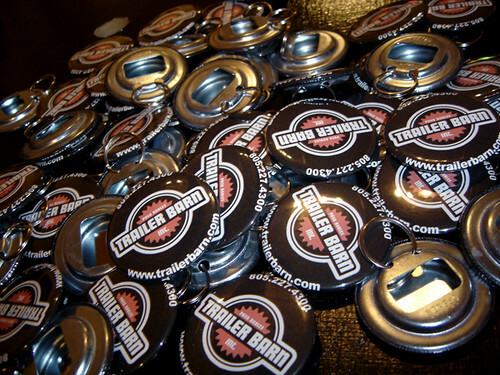 Trailer Barn is your one stop shop for trailers on the Central Coast and used these as a free promotional item to give to their customers. I made these for The 1st Line, which is a badass punk band from Santa Maria CA. They took advantage of the “split order” option so their fans could choose from a couple different designs. They’ve sold these at shows and given them away as freebies. I made a small batch of these for my neighbor across the street from the gallery, Dr. Cain’s Comics. He sells them in his shop and passes them along to friends. 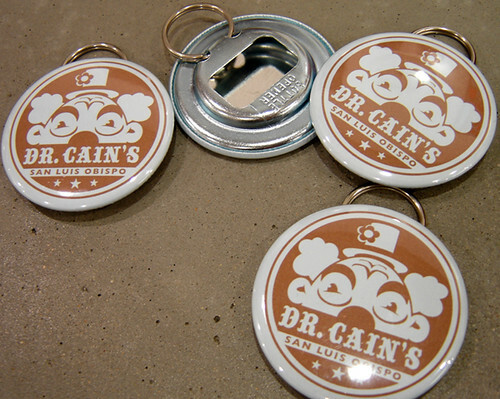 If you’re interested in getting some bottle cap opener keychains made with your logo, graphic, artwork, etc. here is a little break down for you. 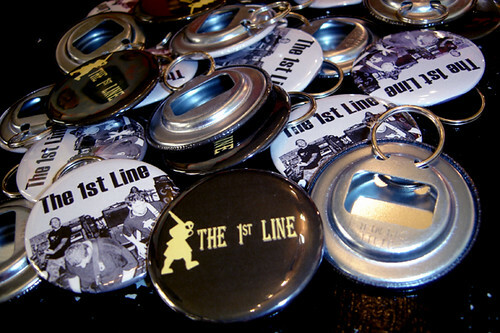 Custom bottle opener keychains are available in increments of 12. For each increment of 12 you can switch your design and still get the price break. If you order 36 you can get 3 designs and it will be $2.50 each. Here’s a little inside secret from one artist to another. I’ve had no trouble selling mine at $5 a piece on etsy and in my retail space. It’s a good markup for you and a great price point for customers. It’s a win win! If you’d like to place an order please use the Contact Form letting me know what quantity you’d like to order and I will email you the template to make your design with. For payment I can send you a paypal invoice or I can take your payment information over the phone. We’ll cross that bridge when we get there. For years people have suggested I make greeting cards and I’ve finally taken their advice. To start out in this new arena I decided on these three images. I have a few options set up if you’d like to buy some of these snazzy little art pieces. Single cards are available for $2.50 each. 5 pack of cards (5 of the same image) are available for $10. 6 pack of cards (2 of each design) are available for $12. So, if you order a pack you do save a little money. If you come into the gallery to buy these in person you are more than welcome to pick any 5 cards to get the deal. Unfortunately, online, that option is not available. Anyway, I’m super stoked with how these came out and I hope you enjoy them too. Click the photo to order or visit my etsy shop.